So, a couple of weeks ago, I had a REALLY busy week. I had to make cookies for the troops and get them sent off (see previous post), a birthday cake for a co-worker, a last minute order for a birthday cake, and a 60th anniversary cake. Thankfully, they were all due on different days, so I at least got a little bit of sleep during the week. Megan really wanted a turquoise lollipop cake for her birthday - vanilla cake (from scratch, of course) with traditional buttercream icing. 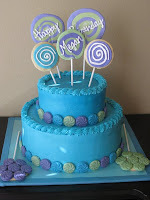 Lollipops are made of fondant and sugar cookies with royal icing decorations. August 27th, 2008 was my grandparents 60th wedding anniversary. How incredible?!! My grandmother asked my mom if I would mind doing the cake. Ummm...of course not! I'd be honored! My grandmother's idea of cake making and decorating is a box cake mix with buttercream icing. Nothing wrong with that. Even though her cakes are boxed, they taste amazing. Probably because they are baked with so much love. :-) Well, my idea of caking is a little different. I have discovered the yummy goodness of scratch cakes (courtesy of Confetti Cakes - THANK YOU ELISA STRAUSS!). Not really caring much about the particulars of the cake, my grandmother left the design up to me (yesssssss!). 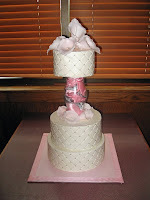 Her only request was that the design be pink and white (YESSSSSSSSSS!). I got straight to work thinking of a beautiful design to celebrate 60 years of marriage. After discussing it with my mom, we decided that soft pink calla lilies with white icing would be stunning. So, a few weeks ahead of time, I made my gumpaste lilies. They were shaping up nicely and I could not wait to see the finished product. Finally! It's the week of and I bake enough cakes for a three tiered masterpiece. Bottom tier - chocolate. Middle tier - chocolate and vanilla. Top tier - chocolate. All with cookies and cream filling. Yummm! Since it's their diamond anniversary, I decided a nice diamond pattern on the side of the cake would be appropriate. And the little, silver dragees give the cake a nice shimmer. I wanted a little bit more drama than just the regular ol' stacked tiered cake, so I set out looking for a tier separator (but not one that would make it look too "Wal-Mart"). After much searching, I had the brilliant idea to use a hurricane globe that I had hanging in my living room (smart, huh?). I stuffed some complementary fabric in the globe and set out for the 3 hour drive to NC. My nerves were shot by the time we arrived in NC. Transporting a cake 3 hours can be quite taxing. I had worked so hard on this cake and I wanted it to be perfect. Once we finally arrived a the restaurant, I got straight to work on assembling this masterpiece. It took me about 45 minutes to get it all set up. My hands were shaking the entire time. Overall, I think it turned out quite nicely (especially for a 3 hour trek up the interstate). What do you think? AMAZING cakes. Wow - you are seriously talented! I love coming here just to drool... thanks for sharing (and also for baking for Colin!!)! Thanks, Kara! I appreciate your sweet comments. You are totally welcome. I had such a blast baking for Colin. I hope he enjoyed his goodies!